Constance Ramos, who left Winston & Strawn in August to start her own Oakland, California-based intellectual property boutique, has become the latest former member of Big Law to bring a gender bias suit against an Am Law 200 firm. The litigation, which has not yet been previously reported, began with a 19-page complaint filed on Aug. 30 against Winston & Strawn in San Francisco County Superior Court. Ramos’ suit accuses the firm of sexual discrimination and retaliation in its treatment of her after she was asked to leave its partnership in early 2016. Ramos is a former Honolulu high school classmate of President Barack Obama, who made pay equity a cause célèbre of his outgoing administration. In 2008, Ramos co-edited a self-published book chronicling some of her classmates’ recollections about their time with the future U.S. president. Contacted at her new firm, which is called Akira IP, and through her lawyer, Noah Lebowitz of San Francisco’s Duckworth Peters Lebowitz Olivier, Ramos declined to discuss her suit against Winston & Strawn. Thomas Fitzgerald, the Chicago-based chairman of Winston & Strawn’s executive committee, did not respond to a request for comment about Ramos’ suit, nor did a spokeswoman for the firm. Winston & Strawn has retained Lynne Hermle, a top labor and employment litigation partner at Orrick, Herrington & Sutcliffe in Menlo Park, California, to defend against Ramos’ claims. Hermle, who represented vaunted venture capital firm Kleiner Perkins Caufield & Byers in its successful 2015 defense against a discrimination suit filed by former investment partner Ellen Pao, did not immediately respond to a request for comment about Ramos’ case. 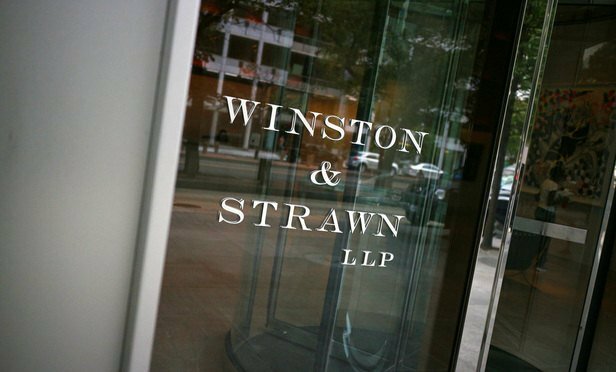 Winston & Strawn has recently made headlines for growing its talent management team and hiring a pair of female IP partners in California to work with its new Silicon Valley office leader, Katherine Vidal, a well-regarded IP litigator who joined the firm in April from Fish & Richardson. Vidal is a board member at ChIPs, a nonprofit that advocates for women in technology law, and since coming aboard at Winston & Strawn has spoken openly about her desire to recruit women and minority lateral candidates to bolster its IP practice. But in her suit against Winston & Strawn, Ramos claims that Vidal (pictured right) told her this summer that her hands were tied when it came to helping Ramos with firm management. Ramos alleges that in early 2016 Fitzgerald told her to leave the firm following the departure of star IP litigator Korula “Sunny” Cherian, who around that time had left Winston & Strawn with fellow partner Robert Ruyak to form RuyakCherian. According to Ramos’ complaint, she joined Winston & Strawn three years ago as an “income partner.” Unlike “capital partners” at the firm, income partners lack equity status are not eligible to vote on firm matters. As a nonequity partner, Ramos was entitled to an annual salary of $450,000 and eligible for an annual bonus if she hit certain hourly billing targets set by Winston & Strawn. But while Winston & Strawn helped Cherian and Wales “acclimate to the firm, develop connections and maximize business opportunities,” Ramos claims that she was never provided with any such benefits, nor was she “assigned a dedicated partner liaison who serves as a go-to resource to answer questions, provide information and facilitate introductions.” Ramos’ efforts to address this perceived snub were rebuffed, according to her complaint. Ramos brought with her to Winston & Strawn from Hogan Lovells one active case: GSI Technologies Inc. v. United Memories Inc., an IP dispute in a federal district court in San Jose, California, in which Ruyak and Cherian advised UMI for more than “a year prior to moving to” Winston & Strawn, according to her complaint. During her first 20 months at the firm, Ramos said she worked almost full-time on the case. About six months before the UMI case went to trial, in May 2015, Ramos said she “became concerned that Cherian’s relationship” with Winston & Strawn was souring. Given her unsuccessful attempts to get an audience with leaders of the firm’s IP group, Ramos said in court papers that she started to worry about “potential adverse consequences the Cherian-Winston relationship may have on her ongoing career” at the firm. Ramos (pictured right) alleges that Joan Fife, the managing partner of Winston & Strawn’s San Francisco office and head of its local labor and employment group, initially reassured her that “the evolving dynamic between Cherian and the firm” would have no impact on her career there. But two months later, Fife told Ramos that she needed to “keep Sunny happy,” according to her complaint. Wales left Winston & Strawn in June 2015 and Cherian followed him out the door four months later. A phone call to Wales at his home near San Francisco in Millbrae, California, went unreturned by the time of this story. Cherian and Ruyak also did not respond to requests for comment about Ramos’ suit, nor did Winston & Strawn’s Fife and Vidal. As Ramos worried about her future at Winston & Strawn, the UMI case went to trial in late 2015. A jury found for the company on the vast majority of claims against it, according to Ramos’ complaint, and a $955,000 damages award against UMI was subsequently vacated by former U.S. Magistrate Judge Paul Grewal, who left the federal bench last year to become deputy general counsel at Facebook Inc. Ramos withdrew from the case in March 2016 as RuyakCherian took control of the matter for UMI. There was still the issue of attorney fees in the dispute between UMI and GSI. A declaration filed by Ramos in the case on Dec. 23, 2015, states that RuyakCherian was owed $803,475 in lodestar payments, with an additional $4.2 million in fees and $565,828 in expenses owed to Winston & Strawn and $1.68 million in fees and $82,338 in expenses owed to Hogan Lovells, according to court records. In May 2016, Grewal denied motions for attorney fees from both UMI and GSI. Ramos’ complaint against Winston & Strawn acknowledges that the issue of awarding attorney fees in the UMI and GSI litigation remains unresolved. On Jan. 5, 2016, Fife informed Ramos to stop actively working on client matters, as Winston & Strawn wanted her to leave the firm and would give her six months to find new employment. Ramos said in court papers that she told Fife she was busy working on a briefing schedule for attorney fees in the UMI case and could not stop doing work “without great prejudice to the client.” On Jan. 13, 2016, Ramos said she received a memorandum from Fitzgerald, Winston & Strawn’s chairman, characterizing her separation as a “voluntary withdrawal” from the firm. On Feb. 29. 2016, Ramos said he received an email from RuyakCherian’s Ruyak (pictured right) notifying her that Winston & Strawn had decided to withdraw its representation of UMI. Ramos’ complaint states that the firm did this without consulting her in order to bar her continued representation of UMI in the litigation. In a March 7, 2016, letter from Fitzgerald to Ramos cited in her complaint, she said the Winston & Strawn leader linked her career at the firm to Cherian and Wales, both of whom had by now moved on, and called her claims to a client relationship with UMI as “utterly disingenuous” because Cherian had “originated the engagement.” Fitzgerald did suggest, Ramos said, that she was responsible for collections from the client. By that point, however, Ramos said in court papers that she had been told that income partners at Winston & Strawn were not responsible for bill collections. Only capital partners such as Cherian (pictured right) would be evaluated on collections, said Ramos, recalling a conversation with Fife. Collections were not a metric that could be used in evaluating an income partner at Winston & Strawn, according to Ramos’ complaint. In a March 17, 2016, letter to Fitzgerald, Ramos said she objected to having her career at the firm tied to that of a male partner. By late April 2016, Ramos received the results of an evaluation from Winston & Strawn’s compensation committee, which reduced her annual compensation by 33 percent, to $300,000. Despite her high billable hour totals on the UMI matter during the previous year, which she claims would earn “similarly situated male attorneys” at Winston & Strawn an additional $100,000 payment for exceptional performance, she received no such bonus. Ramos’ complaint states that over the next few months she tried to make it work at Winston & Strawn, offering her services and experience as a “successful litigator” with “advanced degrees in valuable technical disciplines” to other members of the firm’s IP group. But Ramos alleges that was left out of pitch meetings and excluded from other cases in favor of less qualified male lawyers, according to her complaint, which notes that on one matter where Ramos was allowed to participate, she was denied an origination credit in favor of a male colleague. Efforts to expand her practice into transactional work met similar internal business development obstacles. In March of this year, Ramos was notified that Winston & Strawn’s compensation committee was considering another substantial decrease in her annual compensation. Ramos once again objected to Fitzgerald, who she alleges responded to her by saying that the firm “allocates a portion of office operating costs” to partners in a particular office. Ramos claims this was the first time that anyone at the firm told her that income partners were responsible for such costs. Shortly after that exchange, Ramos’ complaint states that Laura Petroff, a labor and employment partner in Los Angeles and chair of the firm’s compensation committee, told a gathering of partners in San Francisco that all income partners at the firm are judged on three criteria: originations, proliferation and hours worked, the latter a metric distinct from hours billed to account for pro bono matters. Not included was the issue of collections, said Ramos, whose complaint states that during her three years at the firm she generated $1.38 million in originations, a little more than $2 million in proliferations and $2.3 million in personal billings, aside from pro bono work. Despite Winston & Strawn collecting several times more than what she was paid during her three years at the firm, Ramos alleges that her annual compensation was cut to $200,000 on April 4, 2017. The reduction meant that during the previous two years, Ramos’ pay had been slashed 56 percent, during which time she also received no bonus. Shortly thereafter, Ramos was introduced to Vidal, who had just joined Winston & Strawn from Fish & Richardson. Ramos claims she explained to Vidal the “history of gender issues” at Winston & Strawn and how they had “impacted me personally.” The complaint states that Ramos said she looked forward to working with Vidal to “discuss their mutual goals to increase firm diversity and to explain some of the barriers” that Ramos faced as a woman at the firm. During a meeting on June 21, Ramos and Vidal spoke for 90 minutes, with Ramos explaining her difficulties over the past 18 months and hope for a different future, according to her suit. But it was not to be. By mid-July, Ramos alleges that she was passed over for a half-dozen other client matters. In a July 17 letter to the firm’s general counsel, Chicago-based litigation chair Lawrence Desideri, Ramos summarized the events that had occurred since early 2016 and wrote that she had no choice but to resign from the firm. On July 11, Ramos said she filed a complaint with the California Department of Fair Employment and Housing (DFEH) and received her “right to sue” letter that same day. She filed another discrimination complaint with the DFEH on Aug. 21. Ramos is the latest former female partner to sue her firm on gender bias grounds in recent months. In early September, former Sedgwick partner Traci Ribeiro found a new home just months after settling a suit that she filed against the firm in July 2016. An unnamed female partner at Proskauer Rose has also filed a $50 million gender bias case against the firm, while former Chadbourne & Parke litigator Kerrie Campbell is one of three former partners continuing to press their own gender bias suit against that former firm, which was absorbed this summer into Norton Rose Fulbright. A survey released nearly a year ago by legal recruiting firm Major, Lindsey & Africa found that origination credits are often a major factor in the gap between what female and male partners are paid in Big Law.